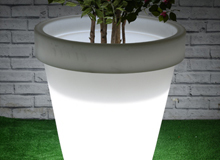 Illuminated Planters - Glow pots great for indoor and outdoor use. 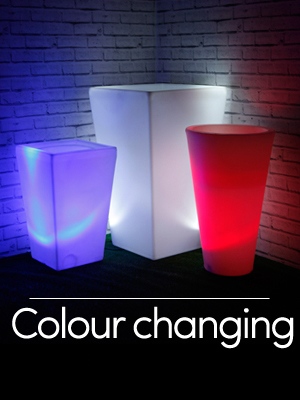 Brighten up your garden this summer with one of our sleek, contemporary remote controlled colour changing LED illuminated garden planters - very popular choice for any modern garden. Designed with elegance in mind, these contemporary planters will enhance any town or country garden. Simple, straightlines show off the beauty of your plants to full effect. Made from a hard-wearing plastic, these planters are lightweight, frost proof and weather resistant. The remote controlled colour changing LED light has many mood settings from a gentle fading to strobe effect. 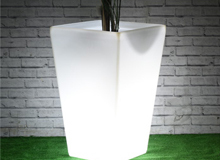 High quality illuminated planters suitable for indoor and outdoor use. 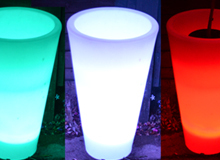 Our planters use colour changing IP68 rated energy efficient LED bulbs. These are controlled via a remote control. You can use these planters in pairs to illuminate entrances and paths or simply brighten up your garden terrace. These planters are not only suitable for homes and gardens but are perfect for bars, restaurants, hotels or shops. 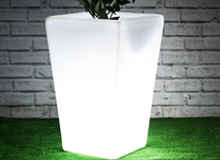 This LED Planter comes with a one year manufacturer guarantee.